Oral, three-way combination anthelmintic for the treatment and control of roundworms, lungworm, nasal bot and itch mite in sheep. In 5L and 20L. of all three components are given with every drench. PYRIMIDE® is a ready-to-use, abamectin-based, broad spectrum triple drench. The active ingredients in PYRIMIDE are abamectin, levamisole and albendazole. 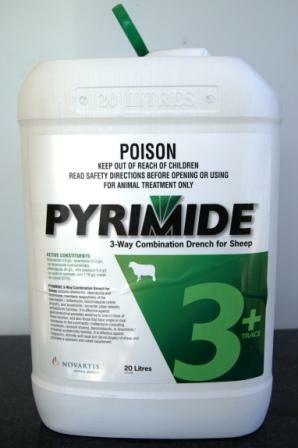 PYRIMIDE also contains the mineral supplements selenium and cobalt. EXPORT SLAUGHTER INTERVAL – DO NOT USE less than 42 days before slaughter for export. MILK – DO NOT USE in sheep which are producing, or may in the future produce milk where the milk or milk products may be used for human consumption.